After another successful “Master’s” Dinner under our belts, it is time again to return to our regular study sessions. A more detailed report on the dinner, including toasts (and possibly photos) will be found in the next issue of The Petrel Flyer. In the meantime, I wish to thank all those who contributed to making it a most memorable evening. Len and Elsa for securing the location and the caterer; the Petrel Players who performed the traditional “How They Met” and “How Watson Learned the Trick”; and to Magician Hewson, who amazed us all with his powers of prestidigitation. (I am pleased to announce that no one was sawn in half and no one disappeared!) Thanks to all our members and guests. 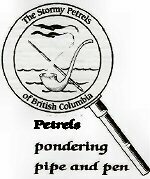 The next regular meeting of The Stormy Petrels will be held, once again chez Wood on Tuesday, April 5th at 7:00 pm. We will be venturing out of the original ‘canon’ and into the apocrypha to have a close look at ACD’s “The Lost Special” first published in 1898, this story concerns the disappearance of a train from Liverpool to London. Could the “amateur reasoner of some celebrity” and the “recognized authority upon such matters” refer to Sherlock Holmes? For more information, please do not hesitate to contact your Consulting Detective.